Daniel Martinez Flamenco Company presents Art of Believing, a must-see powerful flamenco performance bursting with passion and authenticity. Daniel's unique production boasts incredible musicians (singers, guitarists, percussionists, a violinist and a dancer), joining Daniel in a mesmerising and evocative flamenco music/dance show. Art of Believing debuted in Edinburgh's Royal Lyceum Theatre in 2017. 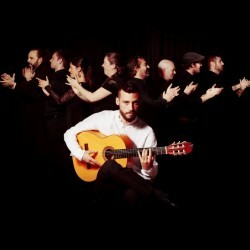 Since, the Daniel Martinez Flamenco Company has been touring with sell-out theatre performances and gracing the stages of prestigious guitar festivals. After 2018's hugely successful Edinburgh Festival Fringe, Daniel returns with his vibrant and exciting production full of fantastic new material.